Surface analysis requires the robust and reproducible application of liquids to surfaces. 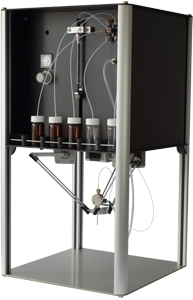 A fully automated robot to spray and deposit liquids to samples. Affordable, flexible and open to new ideas. Mass spectrometric imaging (MSI), LESA, LA-ESI and many other technologies benefit from this technology. we are proud to have a growing community of satisfied iMatrixSpray users, and we are currently building the 3rd batch of instruments. nearly completely pre-assembled kits of this version 2.3 are available for ordering now. we do not only design, assembled and test the device in Switzerland, we also do machine the mechanical parts here. materials used are anodized aluminum and stainless steel, which results in a durable and robust design. the spray head is separately packed for shipping – just unpack the device, mount the head, provide power, gas and matrix and the the spray is ready to go. one hour from opening the box to the first successful matrix coating – no guessing and optimizing. price is 6800 CHF ex. VAT. including all parts. current delivery time 10 days from order. contact us at support@imatrixspray.com for more information or to get a quote. this is a community project – please contribute and send us your input.